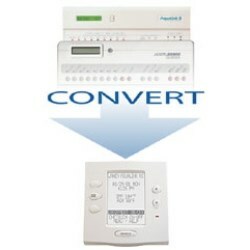 Converting is simple and easy - no indoor rewiring is required. Existing power center, wire cables and valve actuators do not need to be replaced. Take advantage of the intuitive programming of the AquaLink RS system and give Jandy® Ji Series and AquaLink Power Centers the power and flexibility of state-of-the-art AquaLink RS digital technology. OneTouch™, TouchLink™ wired/wireless hand held or PDA wireless hand held, power center bezel and printed circuit board with adapter plate, water temperature sensor and wall plate adapter.